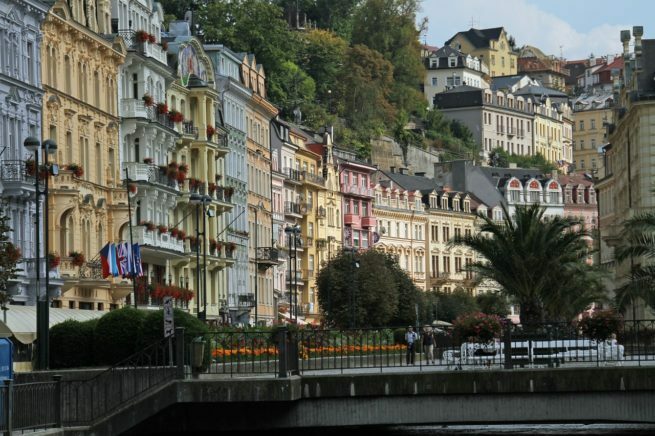 Charter a private flight to Karlovy Vary, a 14th century playground for the elite commonly known as Carlsbad. Whether booking a private flight for a relaxing getaway at one of the city’s luxurious spa resorts or to conduct business in the region, we have access to thousands of Wyvern-certified private aircraft and can arrange the perfect aircraft and flight itinerary for your flight. Jet Charter Europe believes in providing private flyers with a one-on-one consultative service experience that exceeds every expectation. We understand that your time, privacy, flight preferences and most of all, safety, are all extremely important. Our private jet charter representatives are available for you by phone and email 24 hours a day, 7 days a week. When using our private aviation service, you can expect quick response times and an easy, hassle-free booking process. Request a quote or call us today and arrange your private charter flight to Karlovy Vary, Czech Republic. Karlovy Vary is a spa and resort town situated in western Bohemia, Czech Republic, on the confluence of the Ohře and Teplá rivers. Also known as Carlsbad, the city has a lot to offer private luxury jet travelers, from its healing hot springs, international film festival and championship golf, to a variety of hotels and resorts for luxury getaways, business trips and special events. The following list of our top choices was created based on factors such as Jet Charter Europe passenger feedback, location, amenities and online reviews. Once you arrive in the Czech Republic via luxury private jet, our Karlovy Vary Jet Charter service brokers can also arrange ground transportation to/from the hotel of your choice. 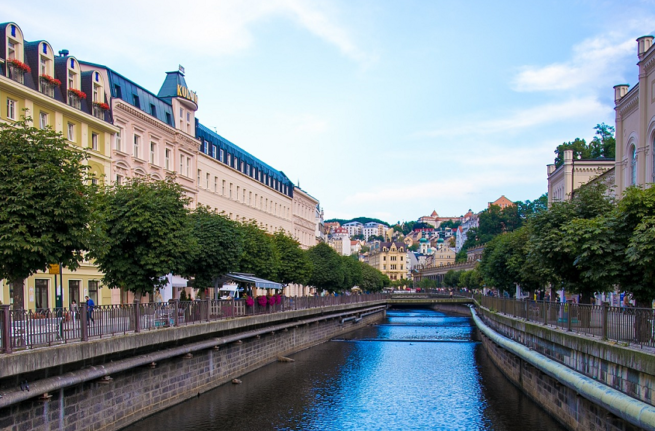 The fashionable town of Karlovy Vary, also known as Carlsbad, is the closest to a glam resort the Czech Republic has to offer private luxury jet travelers. Founded in 1370 and named after Charles IV, the name city translates to “Charles’ Bath”, and the mineral springs found in the lush Tepla valley are said to alleviate an almanac’s worth of metabolic and gastric issues. For this, it was a popular 18th century tourist destination, hosting guests including Tsar Peter the Great, Beethoven, Brahms and Marx. Today, health fanatics travel from eastern Europe and Arab nations to admire the baroque and art nouveau buildings while enjoying sessions of lymphatic drainage and hydrocolonotherapy at local hot springs and wellness resorts. Walking tours and bicycle trips will take you along 180 kilometers of walkways, trails and paths towards the city’s spa forests surrounding Friendship Hill, where the Diana Observation Tower stands. The spa elite were the first to play golf in the area of Bohemia back in 1904. Today, the city has three golf courses and seven more in the vicinity. Charter a private luxury flight and take a stroll while admiring the detailed facades of New Louka, a beautiful canal side street with lots of boutique shops, restaurants and cafes. Bands can be found playing during the summer at the Mill Colonade, another popular local gathering place. The town also hosts an International Film Festival, the largest of its kind in the Czech Republic and the most prestigious in Central and Eastern Europe. Held annually at the beginning of July, the festival presents nearly 200 films from around the globe, and regularly hosts celebrated filmmakers. The towns colorful and whimsical architecture was also used in the filming of the James Bond movie, Casino Royale, where it was the location of many scenes identified as Montenegro. Check out more of our recommendations for luxury private jet travelers staying in Karlovy Vary, Czech Republic. Jet Charter Europe utilizes the following airport to fly clients privately to/from Karlovy Vary, Czech Republic and neighboring areas. Request a Quote or give us a call at 1-888-987-5387 to speak with one of our Karlovy Vary Private Jet Charter service brokers for your next luxury vacation, business trip, or special event.